At this day and age, does anyone still buy a desktop? Well, a laptop is certainly very portable, space-saving and hassle-free. But it has drawbacks. 1. Limited customisation of hardware specs. When purchasing a laptop, you are constrained with the specs that is sold, with limited choices. And I am speaking from experience. Over the past months, I have been searching for a laptop that I can truly enjoy as much as my desktop, but at a hefty price. Some laptops have awful keyboards (which you cannot change), or unimpressive display, or limited connectivity ports, or insufficient storage space, or incapable battery life, or too heavy and bulky. No issues with desktop. Choose the RAM that you can afford, the harddisk that meets your performance requirements, the quality of your monitor that delivers the most accurate colours, and all for a price that is far more affordable than a laptop with the same demands. 2. Limited hardware expansion and replacement capability. You cannot add more hardware as you please, whereas on a desktop you can add as many as you want. My desktop, for instance, currently has 4 physical hard disks, 2 DVD drives, 2 pieces of RAM and can support more. It also has 8 USB ports to let me plug loads of devices. And when something is broken in a laptop, it costs more to replace. And not to mention, you can’t just get any spare parts at retail shops, unless you plug external hardware to it, making it no different from a desktop. 3. Higher price when compared to desktop with identical hardware specs. You can get a top-spec desktop (like ASUS G10) for less than S$1800, but at the price you can only get a decent ultrabook with less processing power. A laptop has its benefits, but one of them is not speed, and it’s not just speed of the processor. Being a long-time computer user since 1988 (my first PC was an Intel 386SX, if that even make sense to you), I manoeuvre a lot faster with external keyboard and mouse, and this translates to work efficiency. And that brings me to my review on this ASUS Desktop PC. Now, we have observed revolutionary features on laptops over the years, but not much is done on the desktop front (as far as I know). You could consider AIO (all-in-one) desktops as part of the desktop family, but it lacks the hardware expandability of a true desktop – somewhat a hybrid of desktop of laptop if you ask me. So, what’s special about the ASUS G10AC-UPS? Check out the last spec item: a built-in UPS. Yes indeed! And it’s not just an ordinary UPS. In the event of a power failure, the UPS will keep your desktop running for 25 seconds while the G10 goes into hibernate mode automatically to protect your work. The UPS doubles as an external power bank, allowing you to charge your devices on-the-go when you’re not using your desktop. It comes with 2x USB 3.0 ports, but do not function as data ports even when the UPS is plugged into the G10. The Windows 8 desktop status bar has a power bank icon to display the battery level. 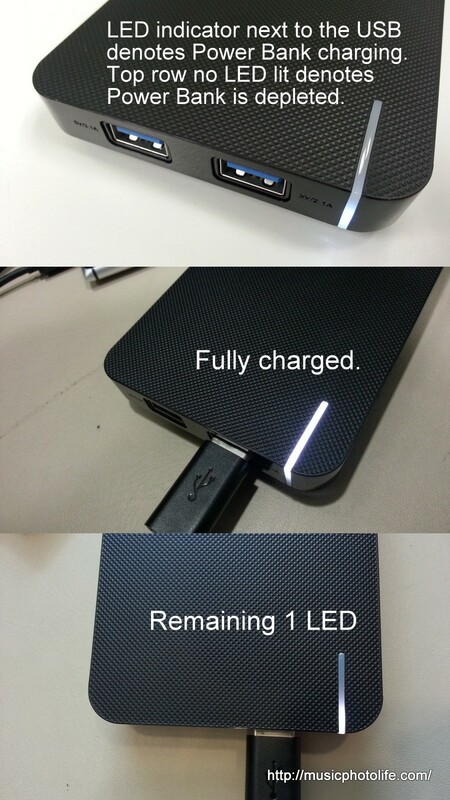 A 4-LED indicator on the power bank provides a guide on the remaining charge level, with a fifth LED indicating that the power bank is being charged. I tried to simulate power failure 5 times and the UPS power bank was merely depleted by 1 bar (out of 4). With a full charge, I used the power bank to charge my devices and surprisingly it only managed to charge my 2100mAh Samsung Galaxy S3 (from 15%) and 2000mAh Nokia Lumia 925 (from 3%) before going flat. So it seems the power bank is capable of powering a desktop for 25 seconds and for more than 5 shutdown cycles, but only enough to charge about 4000mAh worth. Interestingly, even after the power bank is drained, it still can handle one power failure to bring the ASUS G10 into hibernation safely. Somehow, the power bank stores a reserve charge for such scenario where you came back home with a flat power bank and plug it into the ASUS G10 and coincidentally while working on the desktop for a few minutes a power failure occurred. Good work, ASUS. The PC chasis is designed to be elevated at an angle to provide air circulation from the bottom instead of the front and sides, thus offering a better seamless look. When not in use, the front panel may be closed to protect the front connectors from dust. The desktop weighs 14.4kg, size 205 x 465 x 535mm. It is big by modern standards, but if you need the assurance of an uninterrupted power supply on a desktop, you can either purchase a separate bulky and expensive unit, or get the ASUS G10AC-UPS. We all agree that the probability of a UPS kicking in action is extremely rare (I only experienced one power outage in my entire computing life), so having a UPS that doubles as a power bank is a great proposition. The ASUS G10 contains the usual ASUS software that are standard issues with all ASUS computers – like ASUS Launcher, ASUSDVD (CyberLink), ASUS MX Suite (MAGIX Music Maker and Video Easy), ASUS Ai Suite. The powerful 4-core 8-thread i7 processor makes multimedia processing (e.g. Lightroom, video and music encoding) a breeze, but general operations felt no significant difference from my current Intel i5-750 (2.66GHz) processor. 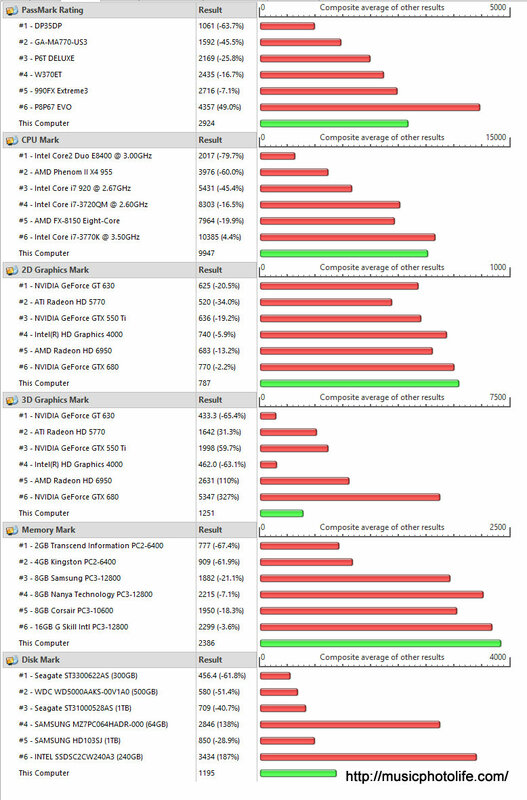 As you can see below, the weakest link is the hard disk performance. Every other component delivers great score. At this day of age, desktops continue to be in demand for the computer enthusiasts who value customisation and hardware flexibility. Thanks to ASUS continuous innovation, we have more reasons to stick with the good old desktops for power computing without fear of losing power and data. I would recommend upgrading to SSD to unleash the full potential of this desktop beast.